The zircon studded hoop earrings is an attractive accessory that combines the glitz of zircons with the zeal of silver. Our lovely assistant Emma, displays the large plain silver hoop earrings and combines them with our plain silver bangle to stunning effect. With a global reputation for reliable quality, it is harder to find hoop earrings with such quality. Every pair has been hand made with great attention to detail. £17.95 - A large pair of the classic design with a new styling. These stylistic and elegant creole earrings add that little touch of sophistication. £19.95 - a gorgeous pair of earrings which combines the filigree styling with the classic creole. Earrings that just never seem to go out of fashion. 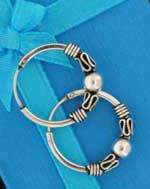 £9.95 - A pair of silver hoop earrings in the traditional bali style. Few collections of silver jewellery would ever be complete without such a pair. £9.95 - made with skills inherited and inspired by the silversmiths of Bali. The centrepiece is a delicately created rope knot of silver wire. £12.95 - The intriguing paradox of round hoops that are square. This distinct and large pair of hoop earrings depart from tradition with a square edge. £7.95 - The discernible design of diamond shaped, creole style, hoop earrings. These earrings beautifully capture all the fine qualities of real silver in a new and innovative silver. £12.95 - A generously proportioned pair of Bali style hoops at a generously proportioned price. Four wraps of the infamous Bali styling create these classic looking hoop earrings. £9.95 - A glitzy pair of hoop earrings decorated with eighteen pretty and shiny brilliant white zircons all set on a neat three quarter hoop earring. £17.95 - Three dimensional novelty earrings in the shape of a cow. Can also be worn as a simple hoop. The hoop ear-rings are made to precise details from hand crafted sterling silver. Some are posted in a velvet drawstring bag and make a lovely present of affordable silver jewellery particularly as there is no need to worry over correct size fittings. The perfect circle creates a unique symmetry of style blending with the lines and cuts of all the latest fashions. Since they are made to a sterling quality, each ear-ring is composed of at least 92.5% pure silver. The remaining 7.5% is copper to add strength to the design. Consequently there is no nickel or other metals likely to cause allergies or irritation. The pound coin in the images, we hope assists in giving a sense of perspective and size.